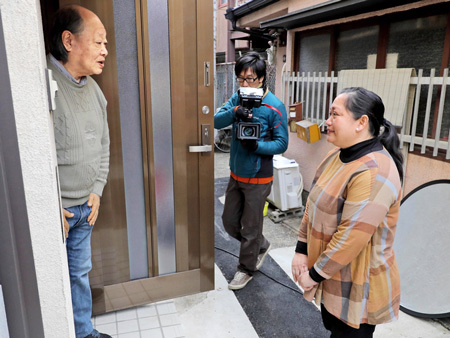 Filming of a video for foreigners living in Japan was carried out in Kamigyo Ward, Kyoto City. The video introduces greetings with neighbors and the manner of using words and phrases. Mentioning unique Japanese expressions, it is hoped the video will lead to relieving anxiety caused by cultural differences. The video was planned by the "Foreign Women's Association Paruyon," a group based in Kamigyo Ward, Kyoto, in order to spread information contained in the association's courses on manners. The group received requests to make the video from foreigners who cannot read Japanese. The video covered three greeting topics, "moving to a new home," "having many friends come to your party," and "greeting neighbors in daily life." A total of 10 people, including three foreigners, participated in filming. Daily greetings with neighbors takes up the phrase, "Odekakedesuka. Dochiramade," meaning "Are you going out? Where are you going?" which is an exchange that many foreigners find strange. Nina Hakkarainen, the representative of Paruyon, said, "We want foreigners to refer to the videos so their neighborhood interactions can go smoothly." The group plans to upload these videos to the video-sharing website "YouTube" in March. Each video is about three minutes long and with illustrations and narration included in the explanatory video.